It all started with a search for this secluded French restaurant called Ditchay's Bistro. I was told about this really cozy restaurant which serves French cuisine in an area near Rene's Saigon Restaurant. It was not even along the main road and you had to go further inside to get to it. When I finally got there, there was a sign that Ditchay's was closed for the time being. And it invited guests to try out a new restaurant called La Terrasse along Rizal Avenue. La Terrasse is also managed by Ditchay Roxas, who is married to a Frenchman. She was at La Terrasse when we got there and introduced her new concept to us. La Terrasse is a representation of Puerto Princesa's international vibe, owing to the fact that the city has a large expat community. It offers a mix of international cuisine fused with local flavors, in what she calls a balance of Asia and Europe. She also mentions her effort to make some local Filipino delicacies palatable to the foreign tongue such as dilis which she tastefully mixes into fried rice. 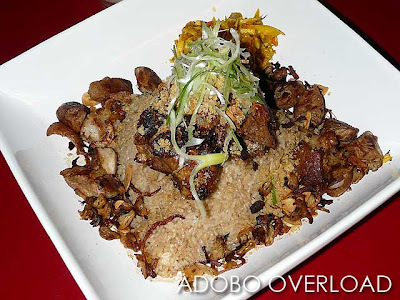 We got to try the sumptuous and sinful Adobo Overload which is chicken and pork adobo twice fried served with a generous portion of rice fried in adobo oil and topped with adobo flakes and chicharon. 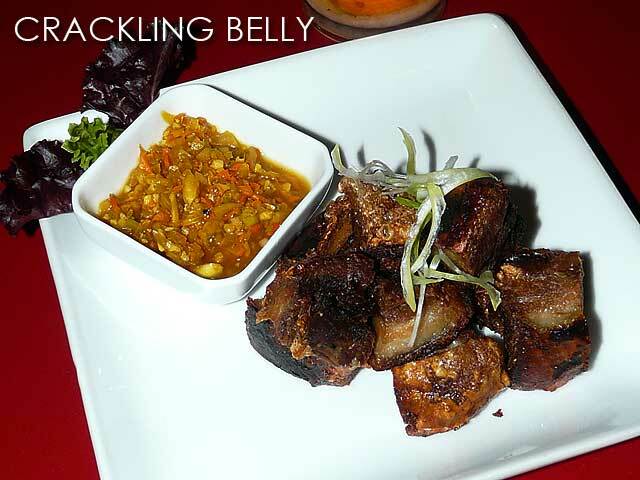 We also ordered Crackling Belly which is her version of bagnet. The menu is still a work in progress though since it's still on soft opening. They expect to launch the restaurant in August. Also in the works is a deli where they plan to sell locally-sourced products such as breads and locally-processed meats such as bacon and ham from Ernie Lim, sausages from a German national based here, and a Spaniard who makes chorizo. Also available will be locally-made cheeses such as Davao's blue goat cheese, carabao cheese from Nueva Ecija, blush blue and pink and margarita cheese. 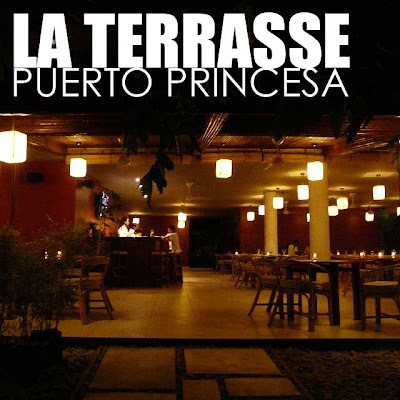 While the quality of some popular restaurants in Puerto Princesa are going down as they continue to sit on their laurels (I hope certain by-reservation only restaurants realize that word is going around that the quality of their food and service is decreasing), La Terrasse provides a breath of fresh air, offering a new choice to Puerto Princesa's locals and visitors. Owing to the success of Ditchay's Bistro, I can foresee that La Terrasse will be Puerto Princesa's next big restaurant. To the fans of Ditchay's Bistro, the restaurant will remain closed until the operations of La Terrasse will normalize. Hopefully, when I do return to Palawan, I can eat at both!